Speck's CandyShell Flip White/Charcoal for iPhone 4S and 4 has a clever flip-back panel that makes docking your phone pretty flippin' easy! 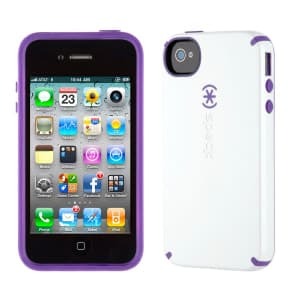 A sleek, hard plastic outer shell protects against impacts and slips easily in and out of your pockets. The rubbery lining absorbs shock and also extends to a bezel, which protects your screen and gives it no-slip stability when you place it face down. Fits iPhone all 4S and 4! Easily removed: just flip back and angle out!